Mom’s Bridal Wreath started to blossom last week. She has been repeating this fact everyday from her bed in the ICU – stating how pretty it is. She talks about this annually on phone calls and honestly I never really knew what it was. She described it to me as a shrub in the back yard so I took a picture this morning to show her how it’s coming along. 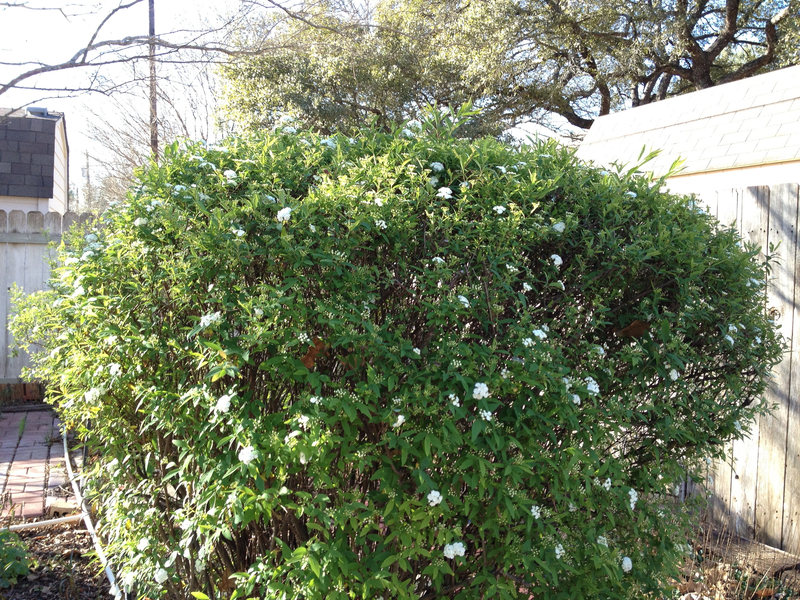 I can remember us always having these bushes in our backyard and I know they eventually blossom a great deal more than this to where it’s a seven foot tall wall of white. I used to think it was a white lilac bush which we always had in Iowa before relocating to Texas. Mom didn’t get into gardening until she moved to Texas in the summer of 1976. As she relates in this video interview, sure she grew vegetables when she had a young family because one almost needed to in order to feed a family of seven children back in the day. But she picked up gardening as a hobby she truly enjoyed in Texas with its super long growing season. She had a tremendous vegetable garden, as one could with a half acre lot. I can tell you though she clearly prefers flowers over vegetables. If you garden, then you know this is like cats vs dogs. I garden myself – to the extent possible in my eighth of an acre lot. I love growing tomatoes, peppers and giant pumpkins. And I enjoy talking about it. My mom’s face lights up when she mentions a blossoming flower in her yard. Her description of the beauty of a single flower is like a summation of the grandeur of the entire universe within the bloom of a single plant. When I think of my mom I think of her surrounded by blossoming flowers.